Shut the Door and Teach: Fourth Grade Test Prep: Math Review Centers with Both Classes! Fourth Grade Test Prep: Math Review Centers with Both Classes! Our state testing is rapidly approaching! My fourth graders will take their math MCAS right in the middle of Teacher Appreciation Week. Sad, but true, so what else can I do? 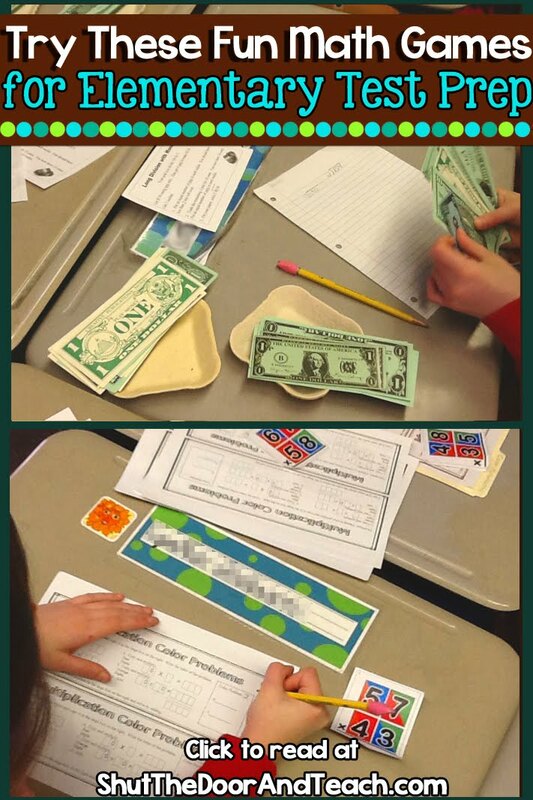 Pretend I didn't realize/care to my kids, whine to my colleagues, and have my fun this week instead with some of their favorite math review centers! When determining activities we would use for our centers, I look at data from our unit tests. 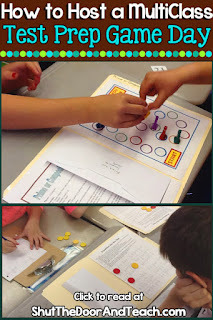 Each year there tends to be a trend, so my games and activities usually target 2 digit multiplication, long division, lowest common multiple, prime and composite numbers, equivalent fractions and fraction of a set. Every so often I pull out these centers and group kids according to which skills they need (keeping a strong student at each group unless I plan to work with the lowest kids while the strong kids have a challenge to do). Then one year I had another idea to really motivate the kids and keep the centers from feeling stale. I asked the other fourth grade teacher in my building what he planned to do for review, and when he said with a sigh, "just keep going over old MCAS tests," I asked if he'd like to join forces! My idea was to "mix up" the classes, and have half of his class come to my room, half of my class go to his, and have a mix of half and half in each activity station. Being the epitome of easy-going, he said sure! We decided to have a nice long block of time, since kids would have a new environment, half of them would be learning a new activity (Mr. E. had his own favorite fraction activities that differed from my usuals) and there would be a whole new group dynamic trying to work cooperatively with kids they hadn't worked with in nearly a year. We also decided on only having kids visit 2 stations in that time so that they got a taste of transitioning (and nearly all could have a chance to visit the "other" teacher's room) but they didn't feel too rushed and frustrated to have to leave an activity just when they were getting the hang of it. So we settled on 45 minutes on the first activity (since it would include some introduction time) and 30 minutes on the second activity, with 5 or 10 at the end to debrief and clean up before lunch. Next, I created a table for the groups. Names of centers (like Least Common Multiple) on the vertical, and teacher's names on the horizotal. I put those kids who could use a challenge into the activities Mr. E. had created, then used my test data analysis to place the other kids into activities that they needed to practice. I made sure I had at a child with a leader-type personality in each, but with my class there is no shortage of those! I knew that if they could teach a center to someone else, they would feel much more confident come test time. Once that was finished, I filled in a second copy of the sheet for session 2, making sure I had different kids in each, and I handed it off to Mr. E.
Once he got me a copy of the finalized roster, I wrote the 7 centers on the board (sorry no photo of this) and a piece of colored construction paper got taped under each. I copied the 6 names for each center underneath, then flipped the papers over and wrote the next six names on the back. This way once we were ready to switch groups, it was as easy as flipping over 7 papers. It went pretty easily! They did have to pack up and bring their centers into the other room at the end of the first session (to help everyone get their change of scenery) but that also ensured couldn't blame any mess on the previous session, since they had to have everything they needed in order to play for the half hour, hehe. Overall, it was a huge success! The kids seemed very invested. They seemed to enjoy showing new people how to do the games they were familiar with, and they concentrated hard on learning a new game that their peers were already familiar with, like Lattice Multiplication. Then they relaxed and had fun until it was time to move on. It really helped keep math practice fresh and interesting during a time of the year when test anxiety can make school feel like the last place you want to be. At the end of the second session, Mr. E.'s kids were thanking me! The following week we repeated the process, but had 3 sessions instead of 2 since they were familiar with the process. I never thought I'd say this, but now I love MCAS review day! How do you keep review interesting prior to your state exams? 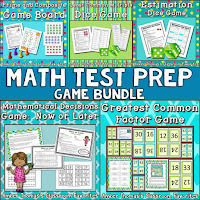 If you'd like a set of games to cover those easy to learn and easy to forget math skills, I've created a Math Test Prep Game Bundle for you. It covers prime, composite, LCM, GCF, estimating, and mathematical decision making. Check it out!